We welcome our newest affiliated overnight camp, Camp Avoda, Executive Director Ken Shifman, and Camp Director Ronni Saltzman Guttin to the JCC camps family! Camp Avoda is an all-boys sports camp started in 1927 and located in Middleboro, Massachusetts. You can read more about Camp Avoda here. 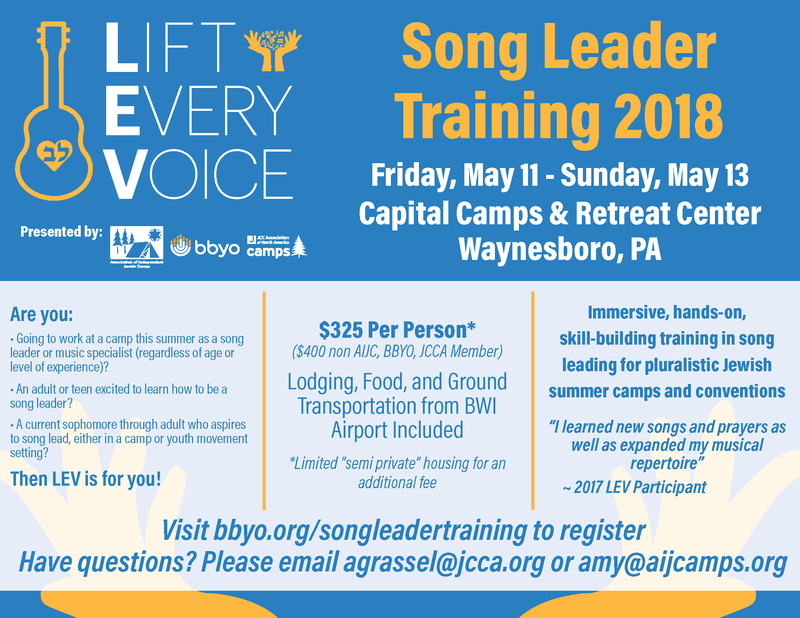 JCC Association, in collaboration with our partners BBYO and the Association for Independent Jewish Camps (AIJC), is excited to offer a song leader training, now in its second year: LEV (Lift Every Voice, or “heart” in Hebrew). This year, LEV will be hosted at Capital Camps & Retreat Center, May 11-13, about an hour and a half from Washington DC. All JCC day and overnight camps are invited and encouraged to send their 2018 song leaders or anyone interested in learning song leading skills! We’re also inviting current 10th and 11th graders from our camps to join LEV, so that you can be investing in the future of your camp’s song leading team now. Last week, our camping team was in Israel with a group of our day and overnight camp directors to interview Israeli shlichim (emissaries) who will be working at our camps this summer. The Israeli shlichim come into the interviews nervous and excited about going to an American summer camp. They can’t wait to fulfill this dream and have this experience, one that they have only ever heard about. Often just having finished their time in the army, the shlichim enter these interviews eager to learn more about their next adventure. Starting a relationship with your shlichim at the interview process keeps them engaged and motivated about their role at camp. Human resources firm Paycor has found that “a proven way to engage applicants from the beginning is to keep them informed of where they are in the process, making them feel important and cared for.” The research also states that driving engagement before a new hire’s first day can be as simple a gesture as sending an email or giving them a call to welcome them, sharing an interesting article or piece of information about your camp, or creating a short, personalized video to welcome them to the team. The JCC Association camping team happily interviews on your behalf when you are unable to attend, but the directors who have attended say that it is invaluable. Camp Mountain Chai Director Dan Baer says, “being at the shlichim interviews for the first time was incredibly valuable. It allows us to get a better sense of character and assess the way they will integrate into our staff culture.“ For those of you hiring shlichim who did not attend the interviews, please make sure to reach out to them so you can begin the relationship with your Israeli staff now, and they can begin to feel a part of your camp community. The earlier you engage with your staff, the more you will both get out of the shlichim program this summer. If you have any campfire stories you would like included in our next newsletter, please send them to agrassel@jcca.org! Outside of their summer camp, Camp JCA Shalom, Shalom Institute has found a number of ways to keep their campers engaged all year. One of the most notable programs has recently celebrated its 10th anniversary. Sherut L’Olam, Service to the World, is a values-based fellowship in which teens can explore social and environmental issues, learn the power of their voices, and become engaged with the world around them. Created in partnership with the local Jewish Federation, the fellowship teaches participants about activism, public speaking, team building, and communication. Graduates of the program have become connected to each other, their local Jewish community, and the causes about which they are so passionate. A parent of two past participants explains the impact the fellowship had on her sons: “My boys have taken full advantage of the leadership skills and social justice education they had the opportunity to take part in. [One son] is now almost 25 and continues to be involved in the Jewish social justice world. He just ran a food insecurity weekend in Detroit. He’s in his first year of law school and hoping to specialize in community housing. [My other son], 21, is in his fourth year of university and deeply involved in the leadership of a peer to peer mental health support club on campus. Thank you for giving my teens, and the hundreds of lucky others, the opportunity to learn, find their inner leader, and introduce them to a bit of the real world they are being handed.” For more information on Sherut L’Olam, contact Arthur Pinchev at Arthur@shalominstitute.com. If you have an engagement idea you’d like to share with the field, please email agrassel@jcca.org. STEM education refers to science, technology, engineering, and math, and is at the forefront of the education world. Many camps have found that bringing STEM educational opportunities into their camp is a way to stay current and bring new program areas that encourage creativity, innovative thinking, and problem solving. Three of ours camps tell us about their exciting STEM programs. In 2008, NJY Camps opened the Dr. Lynne B Harrison Science Center with the mission of providing high quality STEM programming within a Jewish overnight camp setting. Since its inauguration, the program has grown to now include coding, robotics, physiology, astronomy, physics, biology and chemistry. Each program is offered as both an elective for every camper and a specialty camp for those individuals who want to delve deeper into specific areas of focus. Each summer, the Dr. Lynne B Harrison Science Center hosts a science fair, providing a platform for all STEM programs to showcase their hands on projects and experiments to the whole camp. Bender JCC Day Camp’s STEM Mobile! In Montgomery County, Maryland, we are fortunate to have a nonprofit that has a mobile STEM lab (a tractor trailer/RV bus) that tours the county bringing high tech science to high schools. Through some channels we were able to strike a deal to have their mobile lab park in our JCC lot, train our specialists, and provide us with more than enough supplies and experiments to keep kids wanting more from week to week. For summer 2018 we are excited that MD Bio Foundation will provide a larger vehicle that will give us an opportunity for new experiments, more space and even more fun. The ability to provide a “specialty camp” that gives our older campers a morning of STEM and an afternoon of swim, sports, arts, music and more has been a great addition to our summer offerings. The ability to couple that specialty camp with an afternoon STEM specialist for our younger campers has given all of our families a fun and exciting addition for Camp JCC. Check out the below grants to consider for your camp! The Kiwanis Children’s Fund awards grants for projects that provide long-term benefits for children. The areas of focus are health, education, and leadership development. One of the Westinghouse Charitable Giving Program’s strategic areas of giving is education with a focus on STEM. Grants are awarded for programs aimed at improving knowledge and literacy with a focus in the areas of science, technology, engineering, and math. One of the Verizon Foundation’s funding priorities is STEM education for youth. Congratulations to everyone on your new roles in the JCC Camps family! Welcome to the world, new future campers! Jacob Samuel, the first child of Stamford JCC Camp Director Jason Samuel and his wife Katie. Dylan Zachary Speck, son to Emma Kaufmann Camp Assistant Director Rachael Speck and her husband Alex. Nava Bay Allen, the newest addition to Camp Tawonga Director of Wilderness Programs Myla Marks, her husband Wes, and their daughter Ariela. Matilda Jane Bernstein, the first daughter of Camp Tawonga Associate Director Katie Quinn and her husband Jason. Ryleigh Miriam Stern, daughter to Baltimore JCC Camp Director Emily Pesach Stern and her husband Steve. Twins Noah Abraham and Jonah Solomon, the newest additions to the Sideman family: JCC Camps at Medford Assistant Director Sara Sideman, her husband David, and big brother Benny. Mandel JCC of Cleveland Day Camp Assistant Director Abbey Henkin on her marriage to Rob Phillips. Camp Mountain Chai Assistant Director Rachel Shyloski on her marriage to Beth Caplan-Matlow. Have a simcha to share? Email agrassel@jcca.org to include it in our next newsletter. Camp Chi: Associate Director, Chicago, IL. Please send resumes or inquiries to Brad Finkel at bfinkel@jccchicago.org. Tamarack Camps: Program Coordinator, Detroit, MI. Please send resumes or inquiries to Jess Whatley at jwhatley@tamarackcamps.com. If you have other JCC Camp openings to share, please email agrassel@jcca.org. Where in the World is the Lekhu Lakhem IV Cohort? 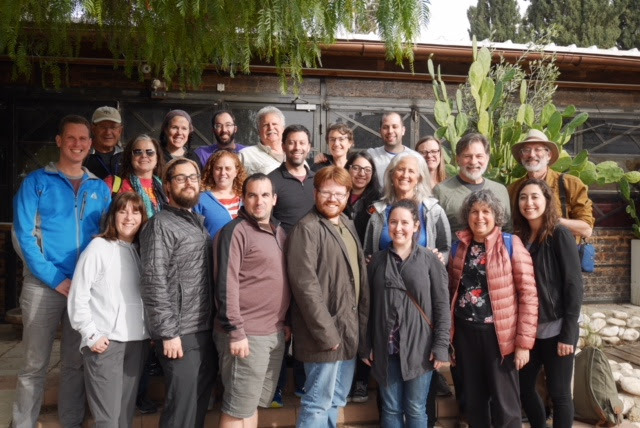 The Lekhu Lakhem IV fellows and faculty are traveling through Israel as part of our two-year fellowship for overnight camp directors. Happy planning for summer 2018! Hello and welcome to the October 2017 edition of S’more Camp News! Mindfulness is…a practice, an approach and perspective to living that helps us be more present to each moment and situation. And mindfulness techniques can be simple to learn, powerful and fun to do. During this program we will learn about and play with various mindfulness actions. Join us to experience how becoming more Mindful can contribute to becoming a healthier happier human. Natalie Goldfein is passionate about personal development and growth. As president of MyHabitUpgrade.com and Natalie Goldfein Consulting, Natalie is a teacher, consultant and coach with more than 30 years’ experience helping people make changes in order do things better, interact more effectively and feel good. Her work with companies, organizations and summer camps! include strategic consulting, leadership training, group facilitation, as well as instruction in the ancient practice of Qigong and Tai Chi. Natalie created the Culture of Kindness Challenge and is the author of Inspiring Energy: Improving Your Life through Simple Changes. Interested in setting a precedent for food justice at your camp? Hazon is offering mini grants to get you started by committing to buy higher-welfare eggs and poultry, becoming part of a movement to improve the lives of farmers, farmworkers, and animals worldwide. The Charles Lafitte Foundation supports four primary causes: children’s advocacy, education, medical research and initiatives, and the arts. The W.K. Kellogg Foundation supports equal opportunity communities, and awards grants to organizations creating innovative projects or programs that align with this mission. JCA of Southern Maine: Camp Director, Portland, ME. Please direct resumes to mrowles@mainejewish.org. Help save the camp cultural exchange program! Last month, we asked you to take action to let the White House know how important the J-1 Visa program is to you and your camp. We know how essential the international staff is at many of your camps, and we want to protect the program. It’s not too late to make your voice heard! Take action here through the American Camp Association. Shabbat is here. I know because the air is softer; quieter. Gently, mixed groups of campers and staff walk around camp to their Shabbat electives, or “Shabboptions.” The Chizuk fellow, in an effort to “strengthen” the Shabbat experience at camp, designs activities to connect every person Jewishly. Some great Shabboptions I witnessed this summer included a nature walk, as we used our senses to be in the moment. As my tour continued, I heard a hearty drum circle in the background beating with intention. To my surprise, I also witnessed a provocative Big Questions conversation about God. These activities engage every camper and staff member with Shabbat in some way—just by doing something different or relaxing or thought provoking. Shabboptions are just one example of the grace of Chizuk fellows across North America as they foster the individualized and intentional relationship between Shabbat, Judaism and its people. If you have any campfire stories you would like included in our next newsletter, please send them over to agrassel@jcca.org! Idea: Camp Hilbert’s Fall Festival at camp. Anyone who thinks Camp is just for summer hasn’t been to the Fall Festival at Camp Hilbert, the Weinstein JCC’s off-site day camp. For the past 3 years, the Weinstein JCC has given the Richmond Jewish community a reason to go to camp – in October! The fall is a great time to enjoy the outdoors, and what better place than a rustic camp setting complete with live music, boating activities on the lake, guided nature walks, a petting zoo and pony rides, field games, and a musical hayride? These are just a few of the activities that await our families who join us for what has become our annual fall tradition. In the years when Sukkot falls during our festival, the teens involved in our community service youth group, Tikkun Olam Super Stars (TOSS), build a sukkah for all to enjoy. Our Fall Festival began from a simple idea of having a community event during the month of October. One idea led to another and soon the plan to host the event at our day camp site was born. While there were some challenges in hosting a big off-season event at camp, the benefits of doing so were quickly realized. First, families whose children had attended camp that summer were able to reconnect with fellow campers and experience camp during another season of the year. Second, this event brought back adults who attended camp when they were kids and hadn’t been back since. Oh, the changes and improvements they saw, especially since camp had just gone through major renovations the year before! Last, families who had never seen Camp Hilbert were able to tour the grounds, have some fun, and consider enrolling in our summer camp. Welcome to the world, two new future campers! Jackson Levi Steinharter, born on Aug. 7, the newest son of JCC Maccabi Sports Camp Executive Director Josh Steinharter and his wife, Meghan. Nadav Eitan Broms, born Sept. 2, the first child of Capital Camps Director Adam Broms and his wife Carrie. Congratulations to Tucson JCC Day Camp Director Josh Shenker on his marriage to Mallory Moore. Connect with us and with each other on the JCC Camps Facebook page! Like our page to catch our updates on events, new programs, and pieces to share on your own pages. 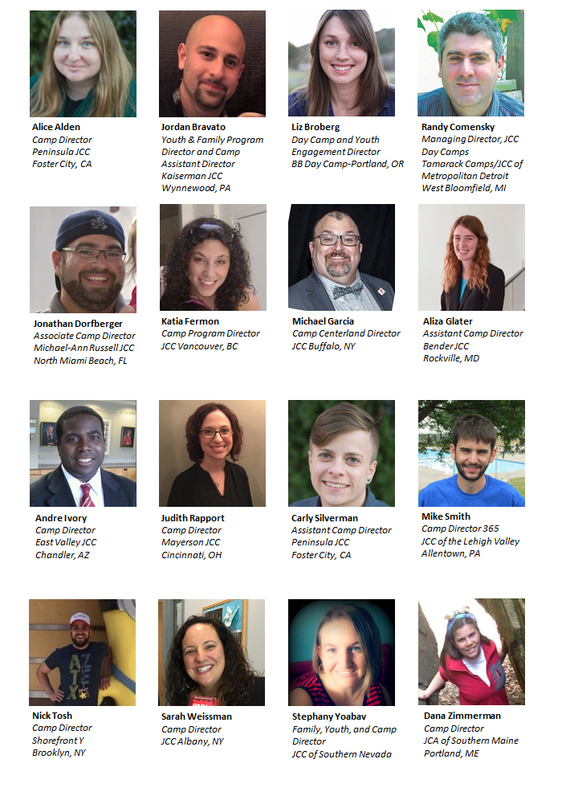 Many of you have had staff changes this year, and some of your camp’s pages are not updated on our website, jcccamps.org. We try our best to stay current, but the best way is for each camp to update your own page with any necessary changes. Please use this form to let us know what changes to make. Congratulations on completing another great summer at camp! Sign Up Today: JCC Camp Staff Trip to Israel! Spend New Year’s Eve in Israel! Experience Israel on an amazing Taglit-Birthright Israel trip this winter with other JCC camp staff, age 18-22. Travel with your tribe—those who love camp—and be exposed to the diversity and excitement of Israel, from its ancient past to the “start-up nation” it is today. Spend time with Israelis who have been JCC Camps shlichim, and learn from the incredible full-time JCC camp professionals and experienced Birthright leaders guiding the trip. Return to camp next summer with a greater love for and understanding of everything that is Israel! Through your personal experiences you will learn new and meaningful ways to bring Israel back to your camp and community. Anyone who has participated on a peer trip to Israel before the age of 18 is now eligible for a second chance to see Israel through a different lens. Next steps: registration officially opens on Tuesday September 5, 2017 at 10AM EST. You will receive information from the AMAZING Israel staff before registration, detailing the process and what to expect. 1. Don’t tell your children horror stories about camp! Sharing your negative experiences with your child only increases their anxiety. Instead of horror stories, share the great times you at the lake, playing sports, or making lots of new friends. Remember to advise relatives and friends to share their positive stories as well. If your child has a bedtime ritual that involves you, now is a great time to begin to create a routine they can do by themselves. Not only will this help your child at camp, but it will show your child that he/she can be independent and in control. Be sure to write letters/emails often. Ask lots of questions. Stay clear of telling them all the fun you’re having (without them), how miserable you are without them, or other news that may upset them. Basic daily living skills and good personal hygiene are critical at camp. We at camp will help strengthen and reinforce these skills, but you can help them by practicing beforehand. Because we love our children and want to ease their (and our own) anxiety, we may be tempted to make ‘deals’ that might have a negative impact on their success at camp. The truth is that most children have a tough day or so when they first come to camp (returning campers can also experience this), but settle in once they get used to the camp routine. Your children will hold you (and us) to these ‘deals’ and we may be powerless to help! 6. Be a Role Model! Help your child be successful by encouraging them (and relatives/friends) to follow the camp rules. Please leave cell phones at home. Also, please send mail and packages without food. We will find it and donate it locally. Parents who break camp rules reinforce to campers that breaking rules is okay. 7. Help us help your child to be successful! Finally, you trust us with your wonderful children. Please also trust us with important information that may affect their time at camp (sick relative, death of a pet, relocation, divorce, etc.). We will treat this information with respect, and it will ensure a successful camp experience for your child. We have excellent camp professionals that include a Social Work Intern who are trained and skilled in helping children cope with challenges. Toni joined the Interlaken team in January 2006. Originally from Philadelphia, PA, she has actively been involved in camping and informal Jewish education since she was a camper at JCC Camp Arthur-Reeta. At a young age our lives revolved around what was happening at the St. Louis JCC. It didn’t matter if it was attending Camp Baer or Sports Camp during the summer or joining the basketball league or playing pool in the game room — we wanted to be at “The J.” We started attending Camp Sabra in 1988 (Mitch) and 1990 (Sean) and never looked back. After our camper years ended, it was an easy decision to start working at camp so we could give the same experience to our campers that we got from our counselors. Those years as campers and then as staff molded us into the people we are today. Most importantly, it put us both on a path to become educators, and to eventually become full-time camp professionals. As camp directors for Pinemere Camp in Philadelphia and Camp Wise in Cleveland, we take pride in providing an exceptional Jewish experience to hundreds of campers and staff each summer that fosters individual growth, a sense of community, and a connection to their own Judaism. Mitch: Mitch is a dynamic leader and comes to Pinemere Camp with over 20 summers of Jewish overnight camp experience! Originally from St. Louis, MO, he is a graduate of the University of Missouri, Columbia (MIZZOU). Mitch grew up at Camp Sabra of the St. Louis JCC, where he rose to the position of Assistant Director, and was most recently Director of Camp Kingswood of the Boston JCC. Sean: Since the fall 2008, Sean has been calling Camp Wise his home. He has been involved in Jewish overnight camping for over 20 years and has played a significant role in the growth and success of Camp Wise. His camping career started at Camp Sabra, the St. Louis JCC’s overnight camp. Ever since I can remember, all of my summer memories took place at the Toronto JCCs. I started attending The Jack and Pat Kay Centre Camp at the age of three, and as I grew older, I began working as a seasonal camp staff member, gaining valuable life skills along the way. I immediately knew that I wanted to give other children the same opportunity that I had, which is why my transition into a full-time JCC camp director was a natural fit. Providing other children with a meaningful Jewish camp experience and further developing strong and confident future leaders in our community has been an incredibly fulfilling experience. Over the years, camp has not only given me the opportunity to create lasting friendships and meaningful relationships, but also it has led me to my bashert, Danielle, who I now call my wife. JCC day camp has shaped who I am and who I want to become, and it will continue to always hold a special place in my heart. Phil Faibish is the Director of The Jack and Pat Kay Centre Camp and has been affiliated with the camp for 20+ years as a camper, C.I.T. and staff. Phil brings a contagious positive attitude and a wealth of knowledge, experience and skill to camp and the camping industry. I love being a part of a community where so many people are determined to make something better. Sometimes it’s the really big events, sometimes it’s the incredibly small moments. Through music, humor, a few words of wisdom, an act of kindness, pursuing a new adventure or simply being included. I’ve always been impressed by the power of our opportunity to enrich a child’s life in a JCC overnight camp. We are uniquely positioned to create an array of exhilarating adventures amidst exceptional facilities, supervised by extraordinary young adult leaders who innately care for & nurture each child while weaving culturally Jewish values into every experience. Infusing k’vod (respect) into the way kids relate to one another during an intense basketball game or when watching a bunkmate perform on stage, ruach (spirit & enthusiasm) into a medley of songs on Shabbat, or initiating mitzvot (a good deed or act of kindness) in between water skiing or ascending a ropes course is not contrived but rather a very natural expression of who we choose to be. Jim Mittenthal is the director at Camp Barney Medintz in Atlanta, Georgia. His summer camping experience has spanned over 30 years as camper, counselor, waterfront director, unit head (at Camp Barney! ), program director, and for six years as the director of another JCC summer camp in Colorado. I am a camp director because it fills me with pride and lets me serve the community with honor and love. My job is to enrich the lives of our campers and their families. I am constantly inspired to deliver positive experiences for kids. My favorite parts of the camp day include greeting campers as they arrive at camp, watching their progress in the pool, and hearing them sing songs every morning. I can measure the impact of our work when campers return as camp counselors, taking the opportunity to make an impact of the next generation of campers. I have a great job in a wonderful community, and memories that will last a lifetime. Andrea Goldstein, Director of JCC Apachi Chicago Day Camp, has been a driving force behind the growth and success of our wonderful camp since it opened in 2003.